Every job has it’s own specs. So you have one which requires the cutting of bricks to different sizes and shapes. The cuttings of bricks and masonry is not overly difficult, and has been being done for millennia. Although it’s possible to cut bricks with a handsaw, you’d have to be pretty desperate to do that. You’re much better off to go with a wet brick saw, which is both accurate and far faster than using your own hands. So how do you do it? I was recently doing some brickwork for an outdoor kitchen I recently finished, so I was able to perfect my technique during the work I did. Work out the cutting line on the brick. Place the brick on the cutting platform, aligning the cutting line on the brick with the saw. Start the saw up, and the water. Ensure there’s a constant flow of water to prevent the blade from overheating and being damaged. Move the brick towards the saw on the moving platform. Use a “step cutting” process, where you cut a small line in it, then draw it back, then a little more, then back. Repeat this process until you cut all the way through the object on the machine. Using the step process prevents too much wear on the blade, and naturally removes all of the excess material from the cutting process. You will need a specific masonry saw when dealing with a small amount of bricks. Similar to cutting wood, mark a cutting line on the brick, secure the brick in a vise. Cut through using a technique similar to wood, with the cut starting on the furthest edge of the brick. It is important to ensure that the blade is rated to cut through the material. 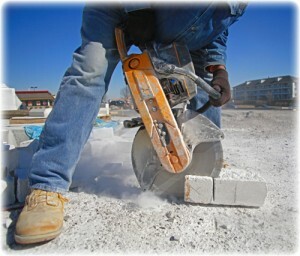 If you get a lot of dust from the cut, ensure you have removed it after each brick. The dust can be extremely harmful to your health.